10 Minutes Agility and Skills. 12 Players, 6 on each side. 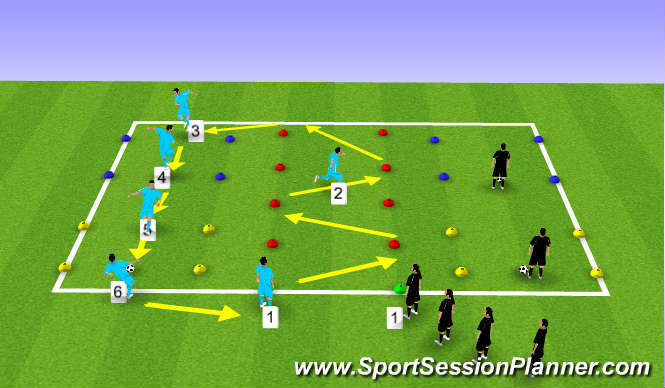 1, Start at Green cones 2, diagonal runs around red cones. 3, Enter the blue square where a player will be waiting with a ball in their hands. Perform with the player, Throw head head catch and 4, replace the player holding the ball in your hands and wait for the next player to enter the box and repeat. Once complete, move on to the next box 5, marked in yellow perform five passes with the player waiting and 6, replace player and wait for the next player. Once complete begin at position1, and repeat whole circuit as many times as you can in ten minutes. Encourage the players to keep good timing to avoid any congestion. Excellent technique and quality at all times. Explosive push offs on red cones or side stepping maybe alternate, adapt to suit own personal goals. Explain the aspects and scenarios that mimic game situations, as all will be experienced during a game so emphasize this fact. This is a good workout that raises the heart rate and encourages good technique.